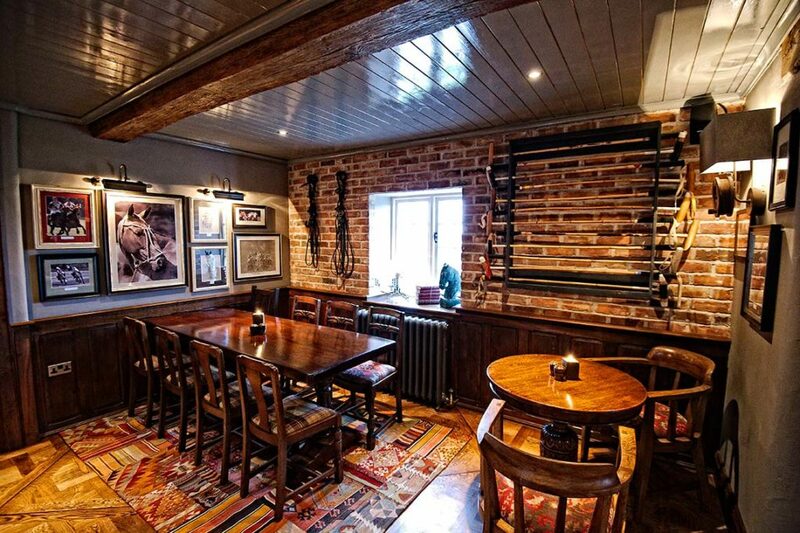 Welcome to The Fishpool Inn in Delamere Cheshire, a cosy, characterful gastro inn dating back to the 18th century. 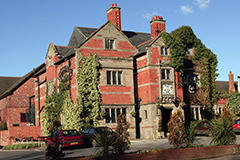 We are the latest addition to the family-owned, Cheshire based hotel group Nelson Hotels, and underwent a dramatic and sympathetic twelve month multi-million pound renovation before re-opening in February 2013. 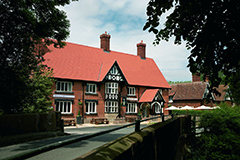 Idyllically positioned on the edge of the enchanting Delamere forest and amidst the stunning Cheshire countryside, The Fishpool is without doubt one of the county’s most popular gastro inns and has recently been awarded the much sought after accolade of ‘Best New Pub’ in the UK at The Publican Awards. The cutting edge, environmentally friendly, open fronted kitchen is a hive of creativity where our passionate, talented chefs work their magic as they cook freshly prepared meals using only the finest, locally sourced ingredients. The seasonally changing menu is varied to suit all tastes and features traditional home comforts and modern British and European dishes. And not forgetting a little taste of Italy with the Fishpool’s flavoursome flatbreads and authentic Italian style pizzas, cooked to perfection in the superior Jestic wood stone oven. A firm favourite at the Fishpool is the unrivalled home-made, hearty pies with their succulent tasty fillings wholly encased by delicious puff pastry. 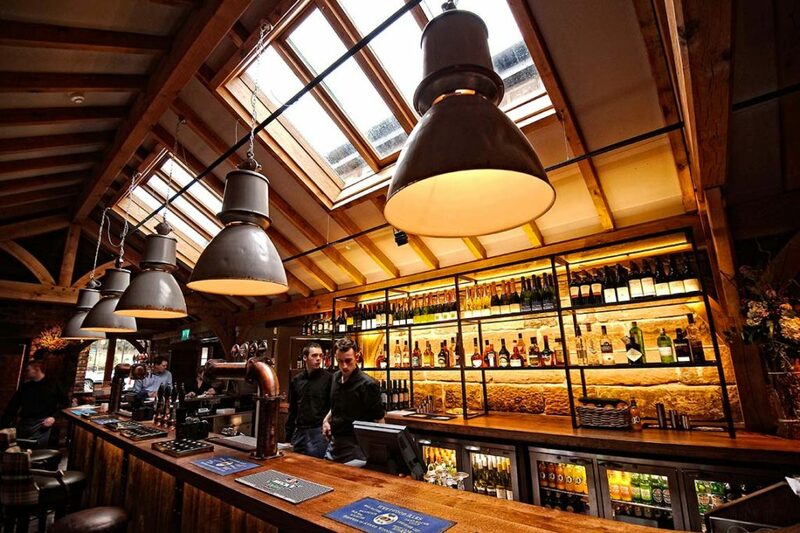 The bar is an impressive and often bustling focal point at the Fishpool with 8 real ale hand pumps taking pride of place. 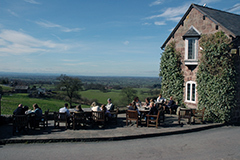 Featuring quality, distinctive cask conditioned beers from many local micro-breweries, Weetwood’s Eastgate, Best Cask Bitter and Cheshire Cat take up a permanent pump each behind the bar with various guest ales featured throughout the year, which are selected according to seasonality. Naturally, we serve a range of premium brand spirits including exciting brands such as Chase, Hendricks and Brockmans, along with an impressive 16 single malts including the more unusual such as the Japanese whisky Yamazaki. We also boast an eclectic and interesting selection of wines from around the world. The Fishpool Inn is all about good taste, creativity and outstanding attention to detail, with the build and décor being no exception. Everywhere oozes superior quality and Cheshire charm. Although recently having undergone a major transformation, the heart, warmth and character of the original 18th century sandstone building has been retained whilst being sympathetically added to using many authentic and natural, reclaimed materials. 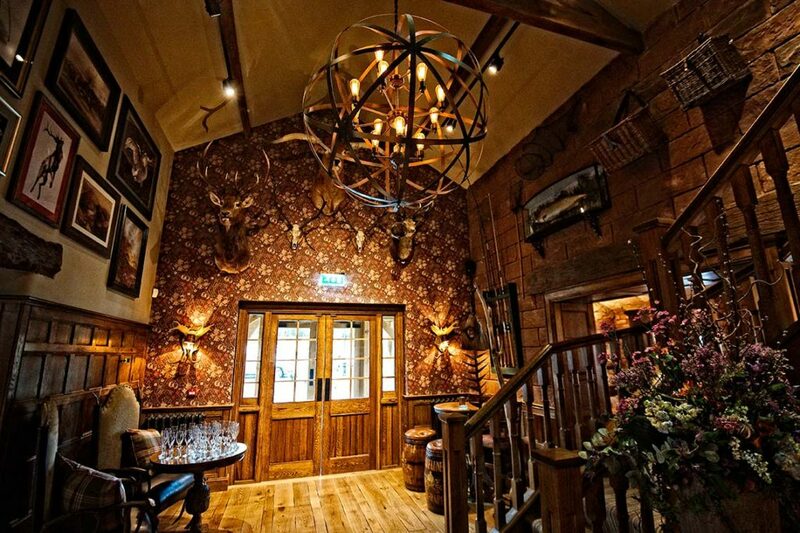 Cheshire’s cultural heritage has been carefully and lovingly captured throughout the inn; you can see this in the many pictures adorning the walls, with the Cheshire Polo Club memorabilia, the saddles and polo sticks, fishing rods and reels and the majestic deer head from Knowsely Estate from 1928. The Cheshire passion for horses is also cleverly captured by the bar area where the seating booths are discreetly sectioned by stalls fashioned from those at the nearby Duke of Westminster’s Grosvenor Estate. There are lots of interesting and unique artefacts dotted around the Fishpool such as the delightful, old Bradbury sewing machines which have been transformed into stunning table bases, lights made from old fishing reels, a cheese churner, bar stools made from vintage beer barrels, chair arms created from antlers, and a traditional skiff fishing boat hanging upside down from the ceiling within the beautiful hand-carved oak structure which forms the new extension. 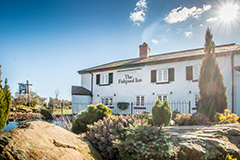 With its stunning and quirky interior from the quintessentially British Victorian tiles and impressive log fires to the décor inspired by Cheshire’s favourite pastimes, The Fishpool Inn is as much a feast for the eyes as it is for the stomach. 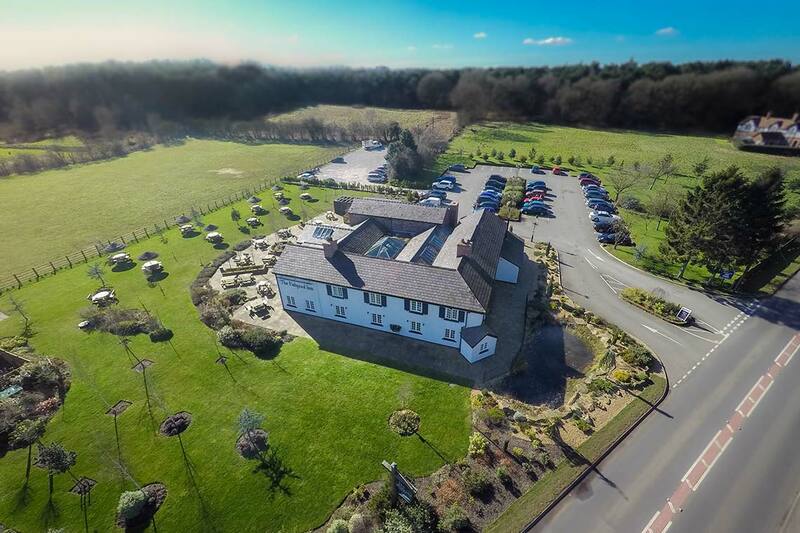 At the Fishpool Inn you can experience a true taste of Cheshire where the old and the new fuse together seamlessly and traditional rustic charm perfectly marries contemporary class. 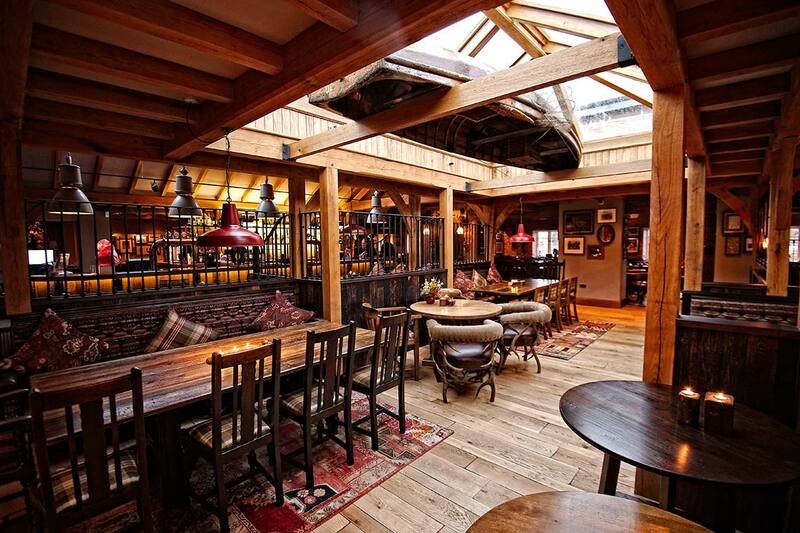 Whether enjoying a tipple or two on the outdoor terrace with picturesque beer garden, perfect for al fresco dining during the warmer months, or a hearty meal by one of the cosy log fires come winter, all guests, including our canine friends, will experience a warm welcome and the highest of standards in unique yet ambient surroundings. 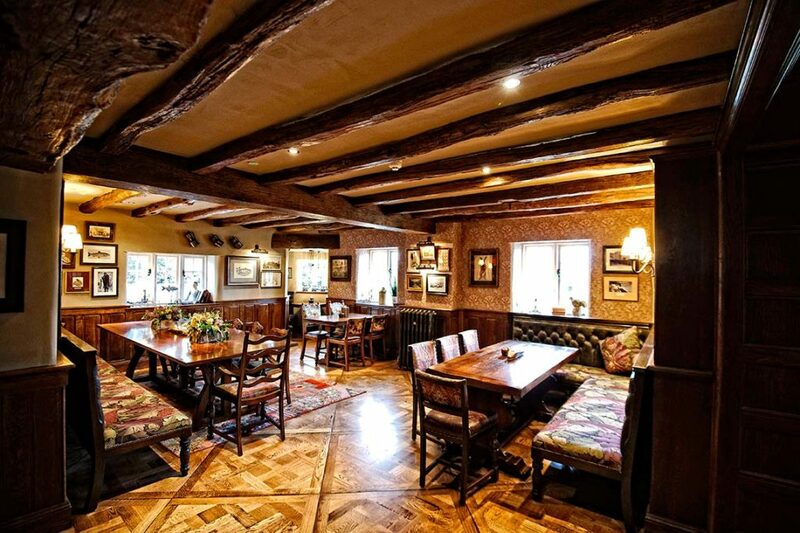 The charming Fishpool Inn is sure to be a memorable choice for all visitors. The Fishpool Inn is dog friendly, we more than welcome your canine friends through our doors. We have limited tables in our dog friendly dining section. To reserve a table in this area please contact us directly on 01606 883277.